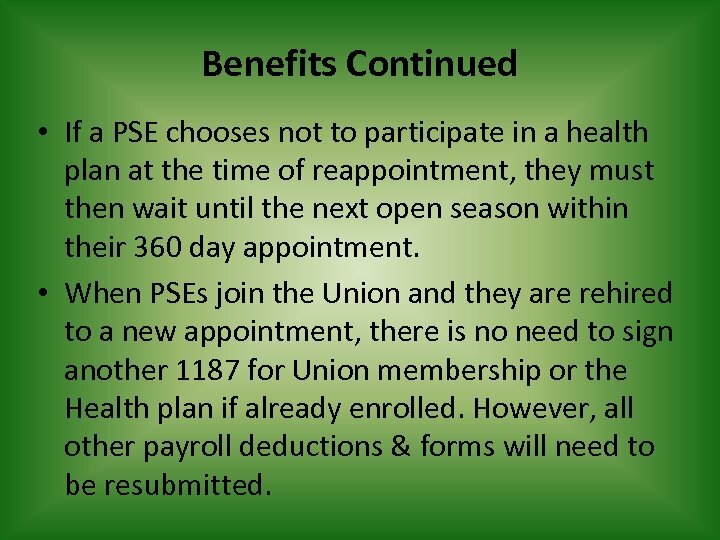 Benefits Continued • If a PSE chooses not to participate in a health plan at the time of reappointment, they must then wait until the next open season within their 360 day appointment. 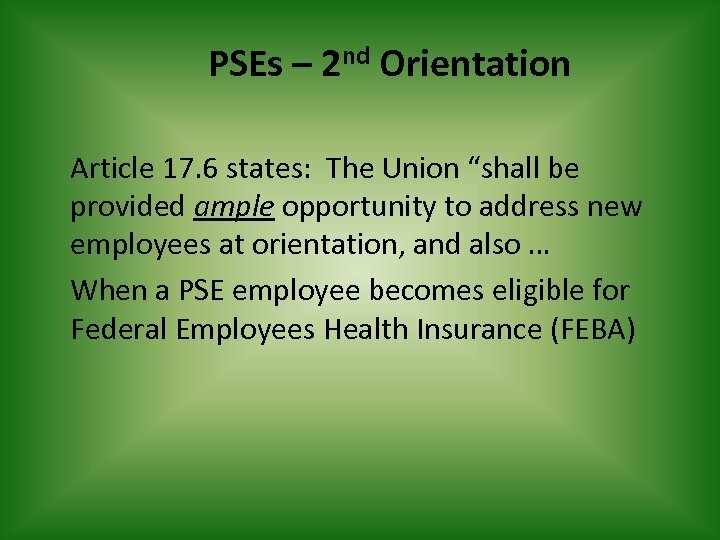 • When PSEs join the Union and they are rehired to a new appointment, there is no need to sign another 1187 for Union membership or the Health plan if already enrolled. 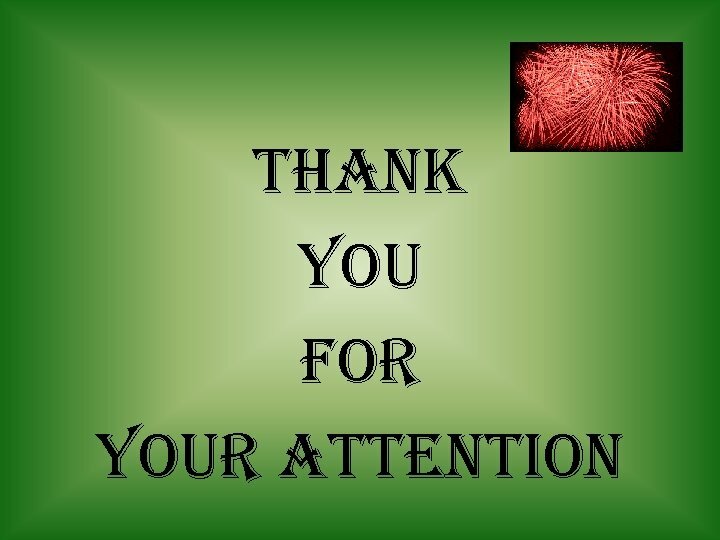 However, all other payroll deductions & forms will need to be resubmitted. 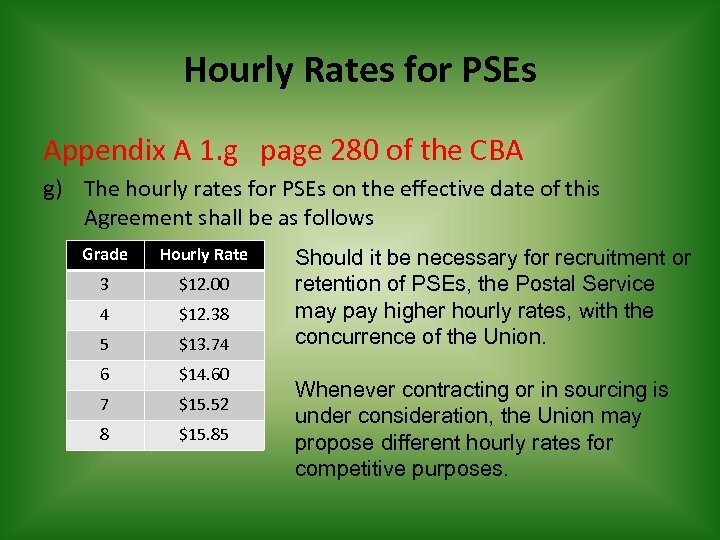 Hourly Rates for PSEs Appendix A 1. g page 280 of the CBA g) The hourly rates for PSEs on the effective date of this Agreement shall be as follows Grade Hourly Rate 3 $12. 00 4 $12. 38 5 $13. 74 6 $14. 60 7 $15. 52 8 $15. 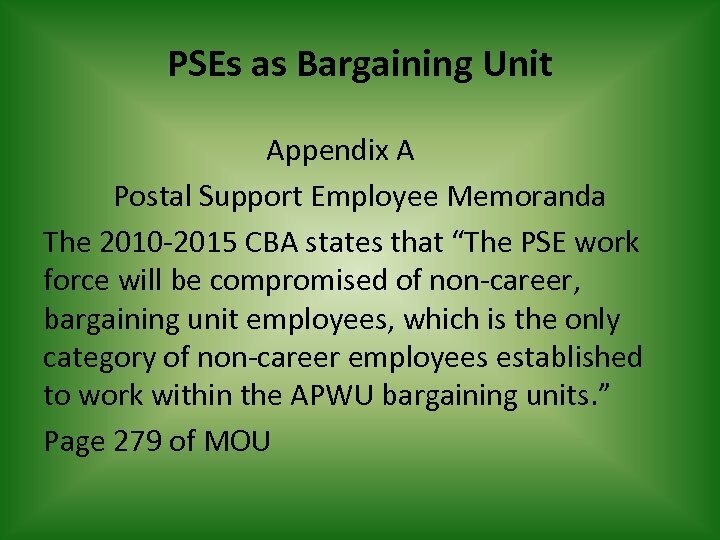 85 Should it be necessary for recruitment or retention of PSEs, the Postal Service may pay higher hourly rates, with the concurrence of the Union. 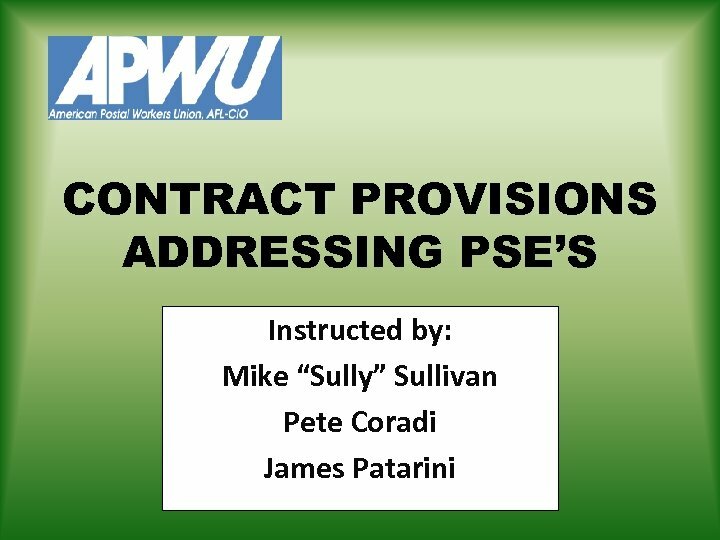 Whenever contracting or in sourcing is under consideration, the Union may propose different hourly rates for competitive purposes. 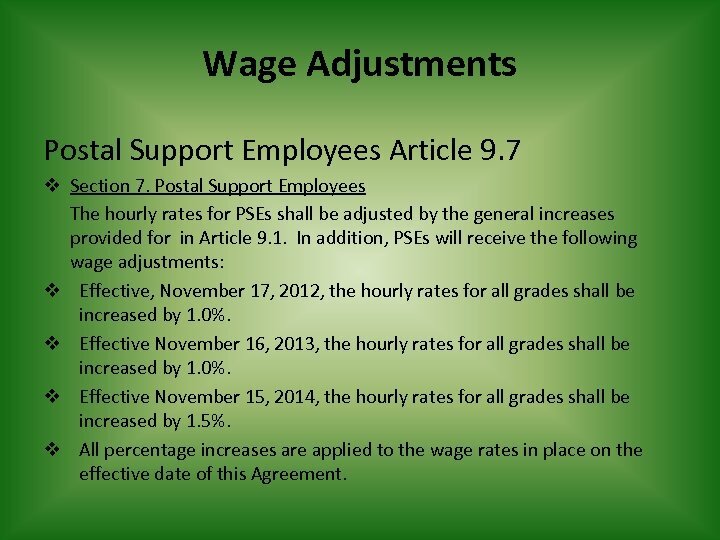 Wage Adjustments Postal Support Employees Article 9. 7 v Section 7. 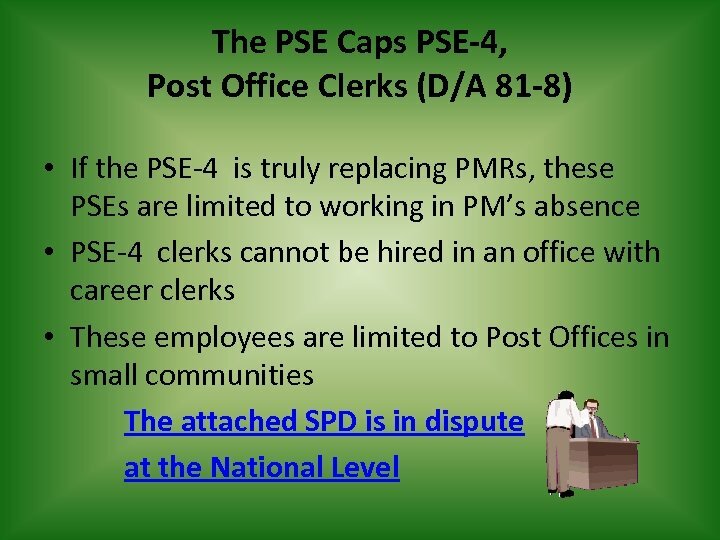 Postal Support Employees The hourly rates for PSEs shall be adjusted by the general increases provided for in Article 9. 1. 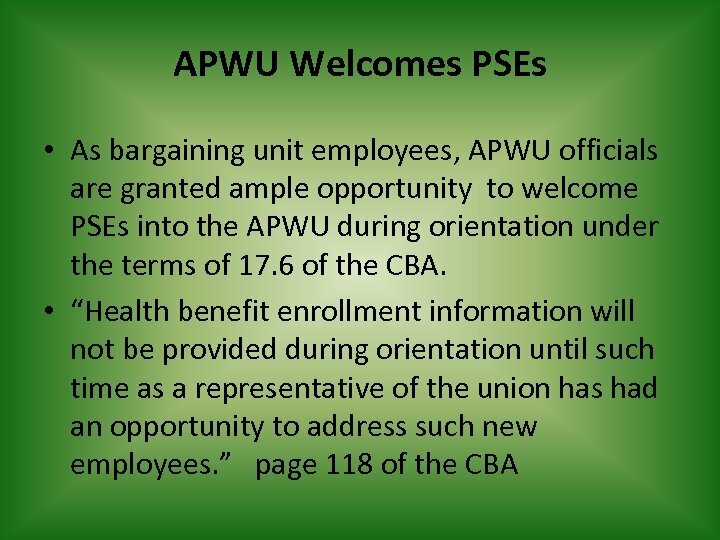 In addition, PSEs will receive the following wage adjustments: v Effective, November 17, 2012, the hourly rates for all grades shall be increased by 1. 0%. 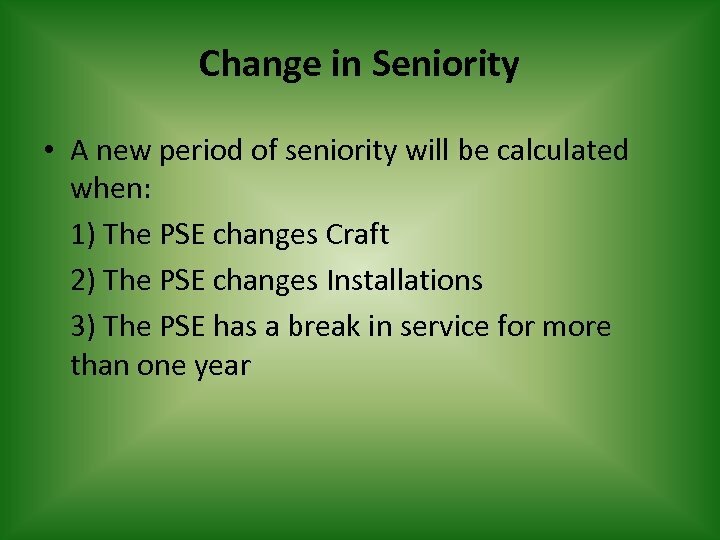 v Effective November 16, 2013, the hourly rates for all grades shall be increased by 1. 0%. v Effective November 15, 2014, the hourly rates for all grades shall be increased by 1. 5%. 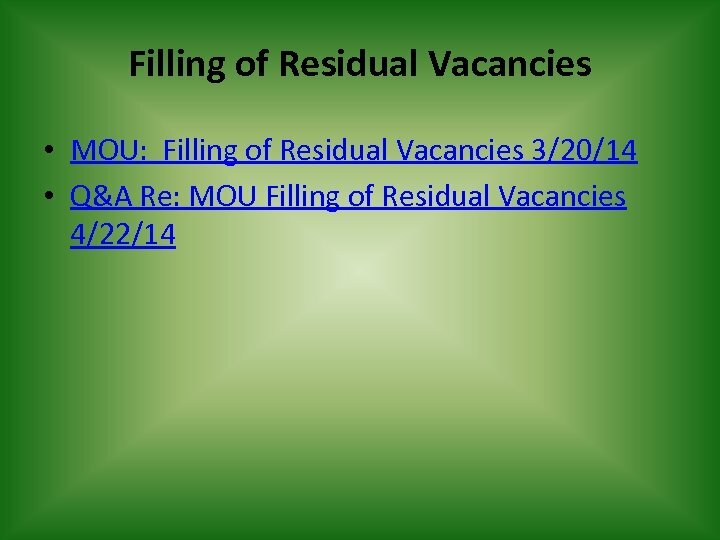 v All percentage increases are applied to the wage rates in place on the effective date of this Agreement. 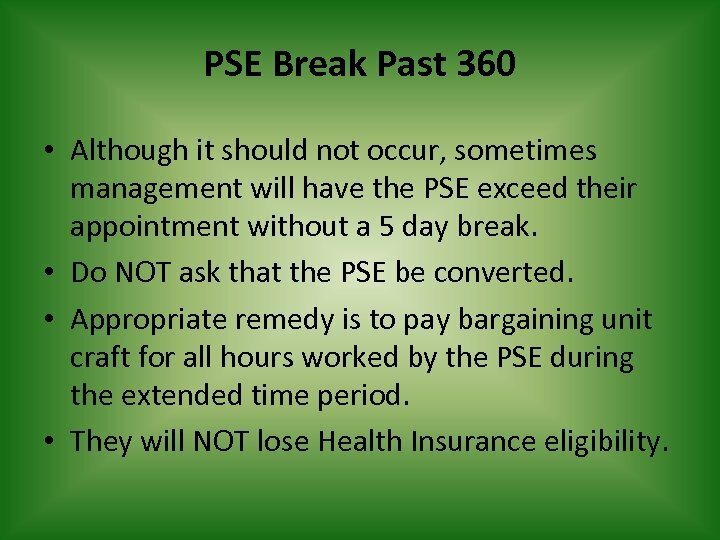 PSE Break Past 360 • Although it should not occur, sometimes management will have the PSE exceed their appointment without a 5 day break. 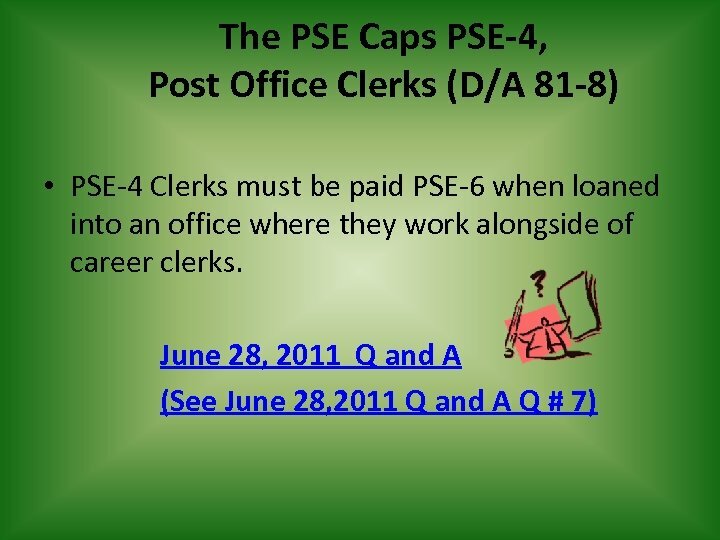 • Do NOT ask that the PSE be converted. 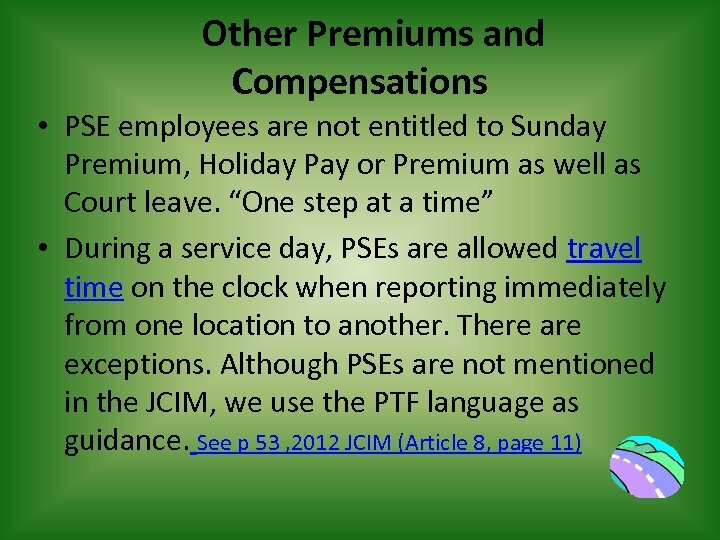 • Appropriate remedy is to pay bargaining unit craft for all hours worked by the PSE during the extended time period. • They will NOT lose Health Insurance eligibility. 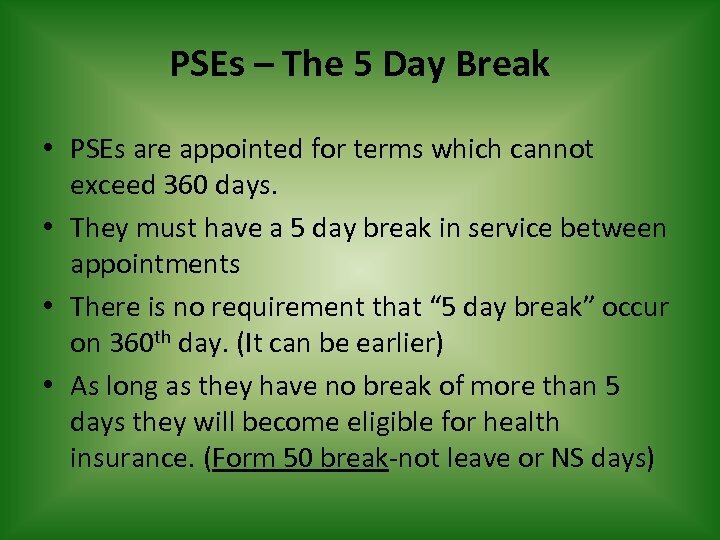 PSEs – The 5 Day Break • APWU Position: Senior PSEs cannot be let go for lack of work while junior PSEs are retained. 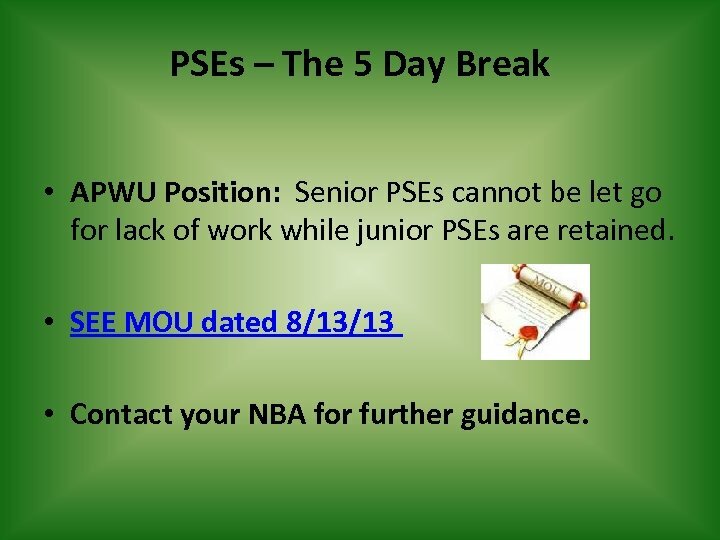 • SEE MOU dated 8/13/13 • Contact your NBA for further guidance. 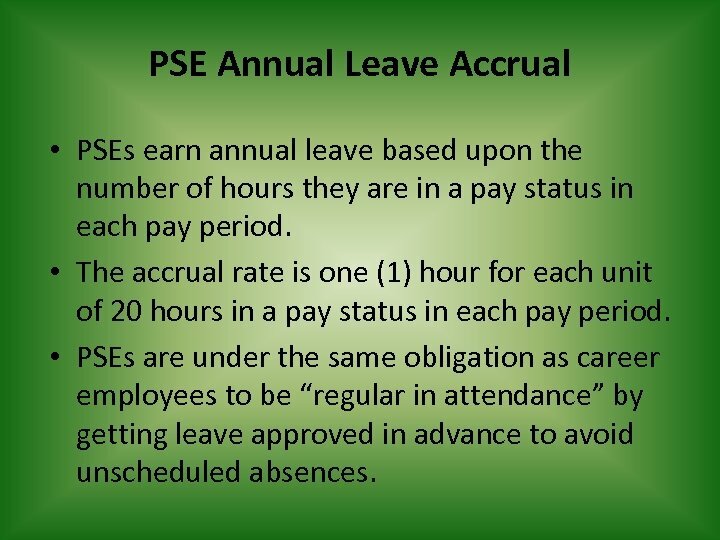 PSE Annual Leave Accrual • PSEs earn annual leave based upon the number of hours they are in a pay status in each pay period. • The accrual rate is one (1) hour for each unit of 20 hours in a pay status in each pay period. 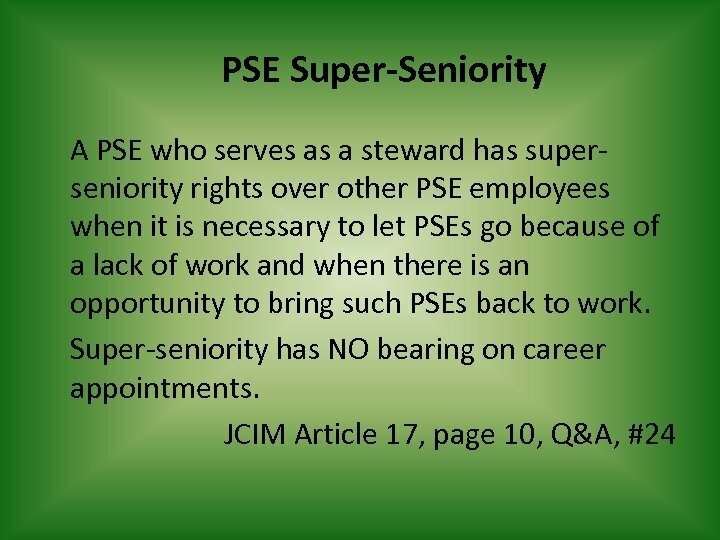 • PSEs are under the same obligation as career employees to be “regular in attendance” by getting leave approved in advance to avoid unscheduled absences. 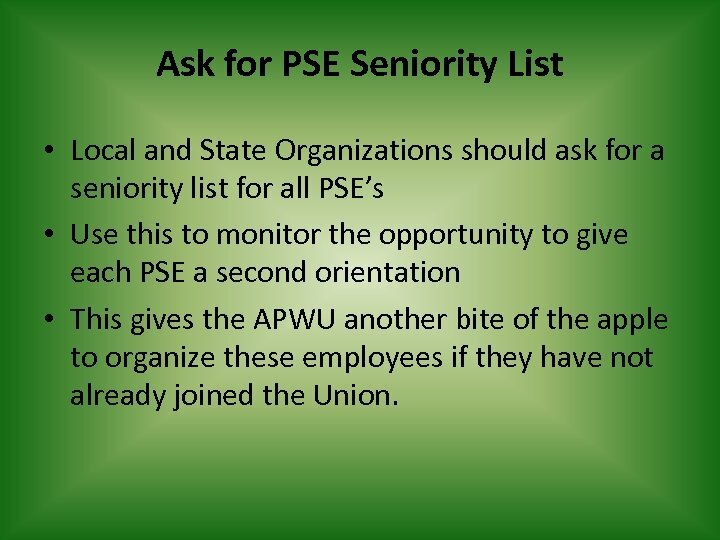 Ask for PSE Seniority List • Local and State Organizations should ask for a seniority list for all PSE’s • Use this to monitor the opportunity to give each PSE a second orientation • This gives the APWU another bite of the apple to organize these employees if they have not already joined the Union. 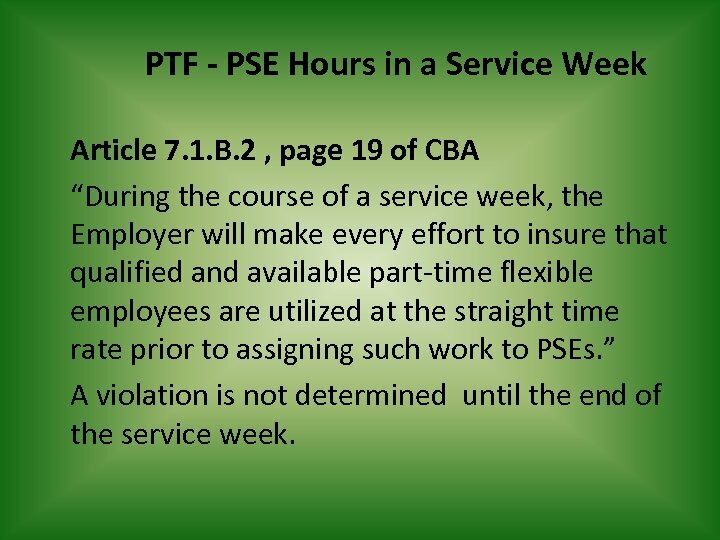 PTF - PSE Hours in a Service Week Article 7. 1. B. 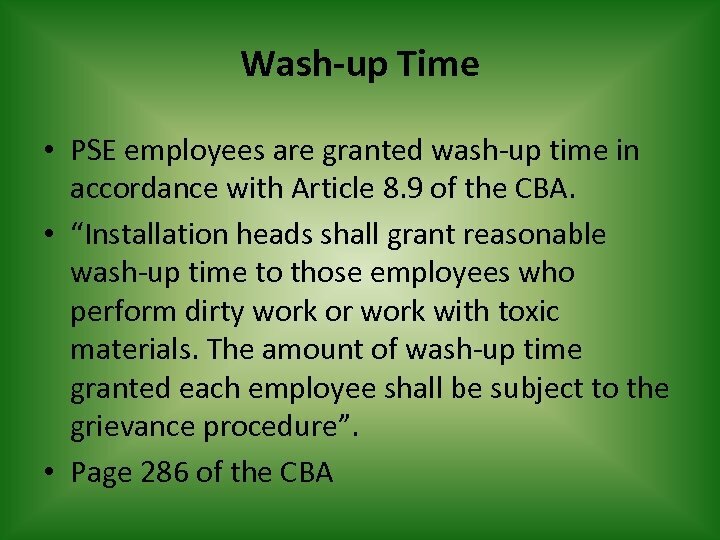 2 , page 19 of CBA “During the course of a service week, the Employer will make every effort to insure that qualified and available part-time flexible employees are utilized at the straight time rate prior to assigning such work to PSEs. 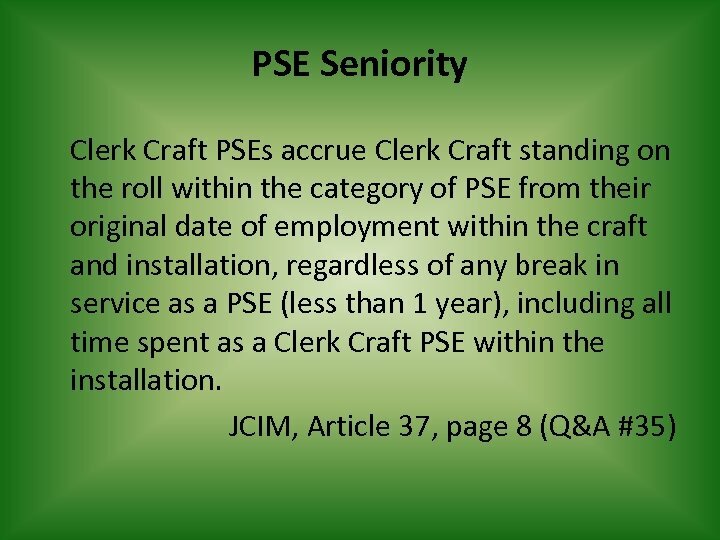 ” A violation is not determined until the end of the service week. Article 8. 4. 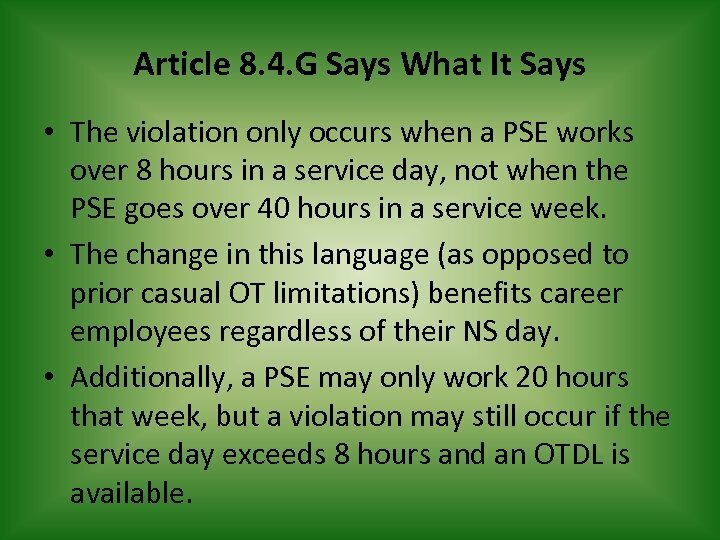 G Says What It Says • The violation only occurs when a PSE works over 8 hours in a service day, not when the PSE goes over 40 hours in a service week. 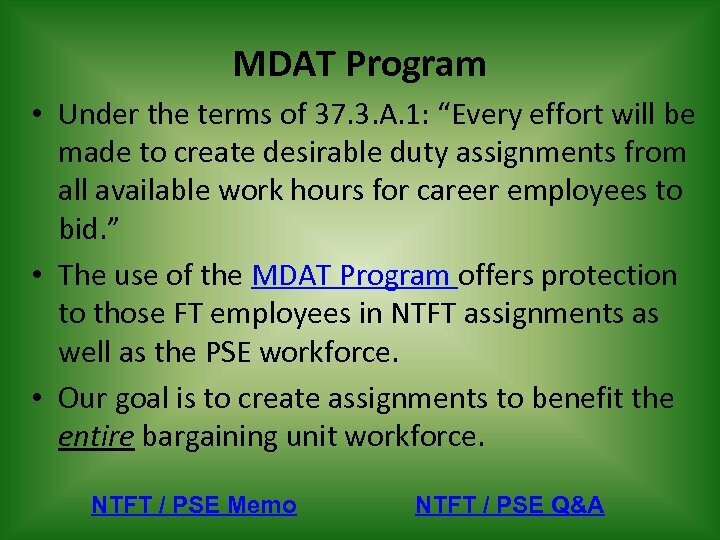 • The change in this language (as opposed to prior casual OT limitations) benefits career employees regardless of their NS day. 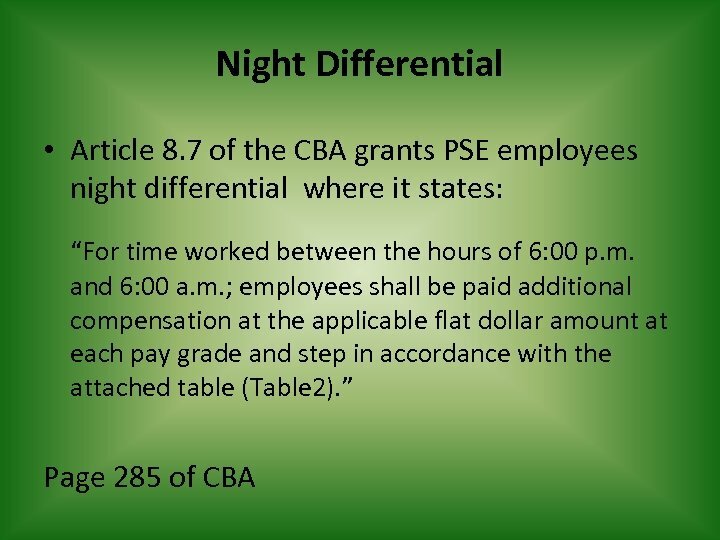 • Additionally, a PSE may only work 20 hours that week, but a violation may still occur if the service day exceeds 8 hours and an OTDL is available. 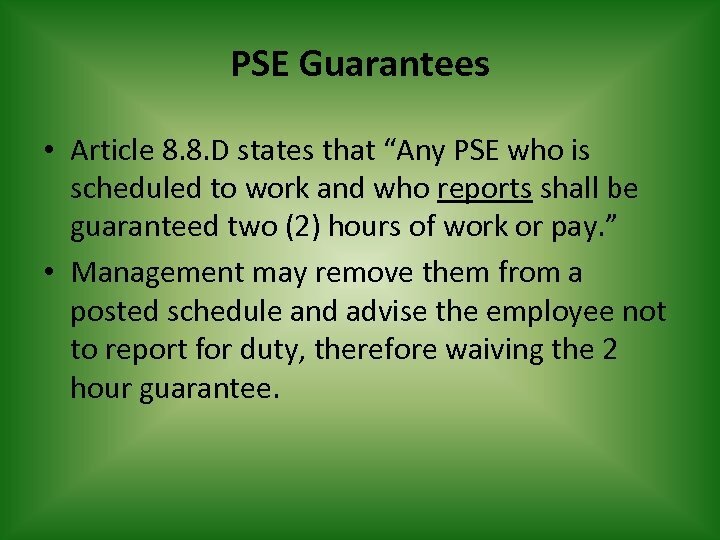 PSE Guarantees • Article 8. 8. 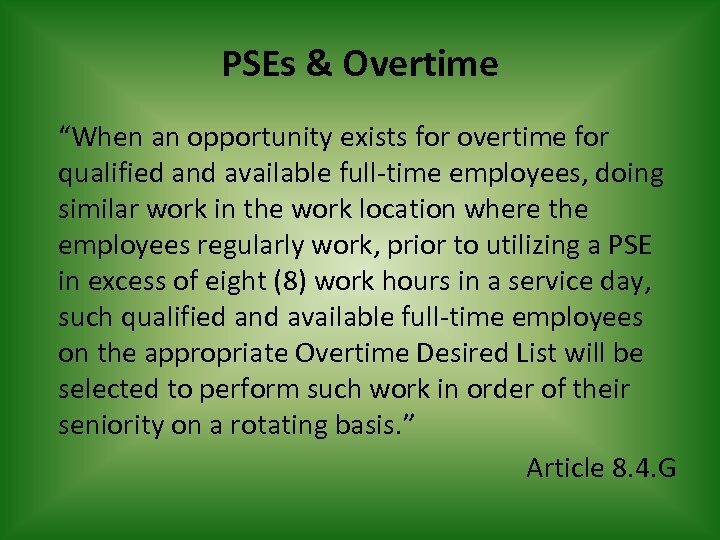 D states that “Any PSE who is scheduled to work and who reports shall be guaranteed two (2) hours of work or pay. ” • Management may remove them from a posted schedule and advise the employee not to report for duty, therefore waiving the 2 hour guarantee. 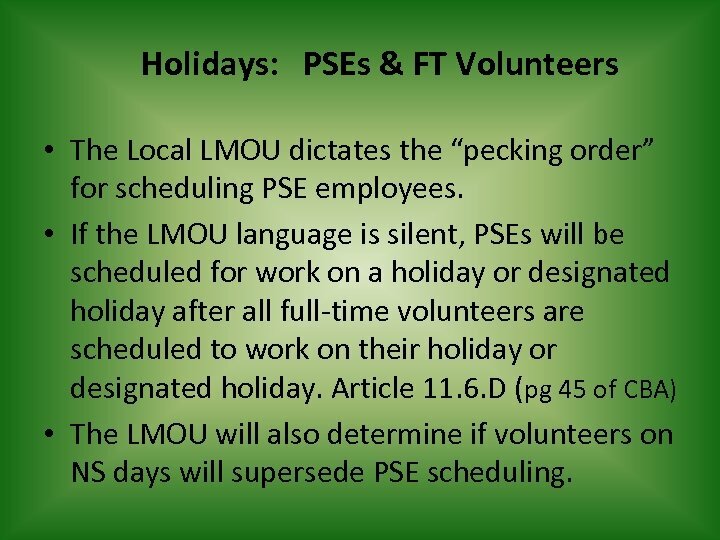 Holidays: PSEs & FT Volunteers • The Local LMOU dictates the “pecking order” for scheduling PSE employees. 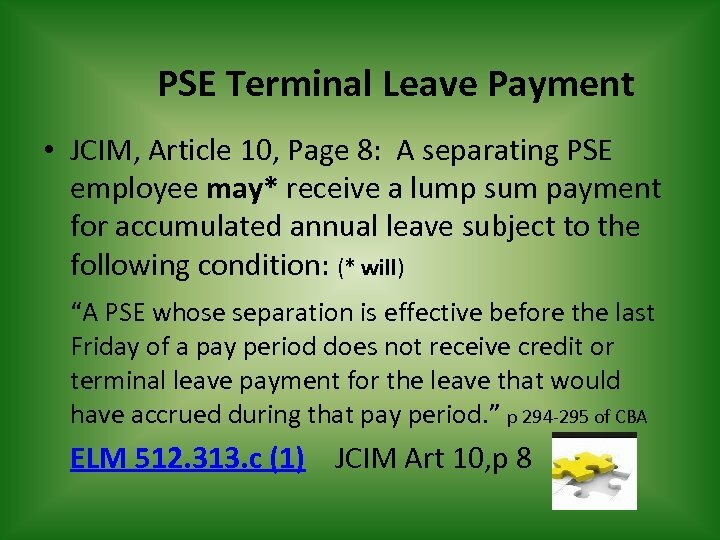 • If the LMOU language is silent, PSEs will be scheduled for work on a holiday or designated holiday after all full-time volunteers are scheduled to work on their holiday or designated holiday. Article 11. 6. 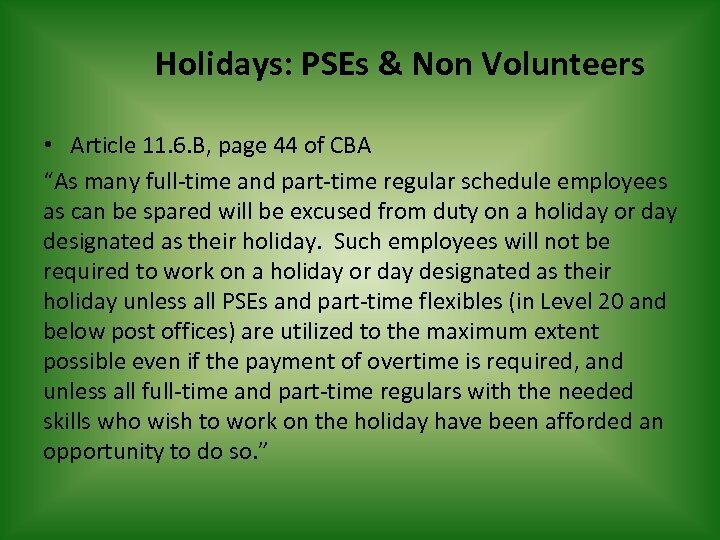 D (pg 45 of CBA) • The LMOU will also determine if volunteers on NS days will supersede PSE scheduling. 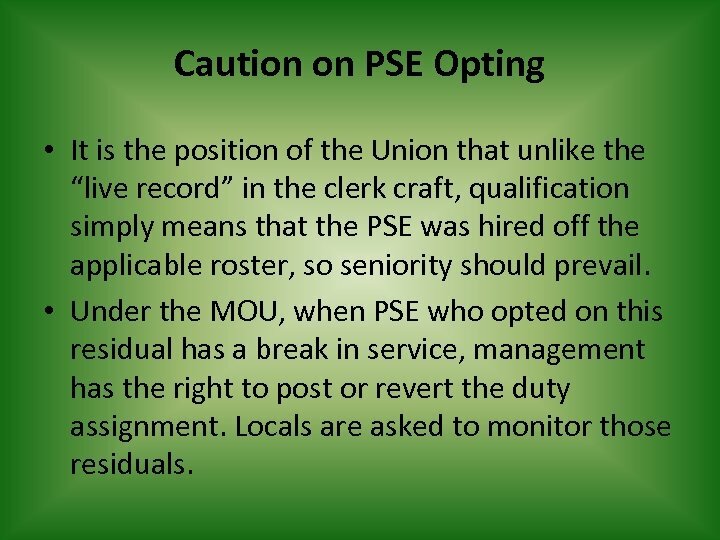 Caution on PSE Opting • It is the position of the Union that unlike the “live record” in the clerk craft, qualification simply means that the PSE was hired off the applicable roster, so seniority should prevail. 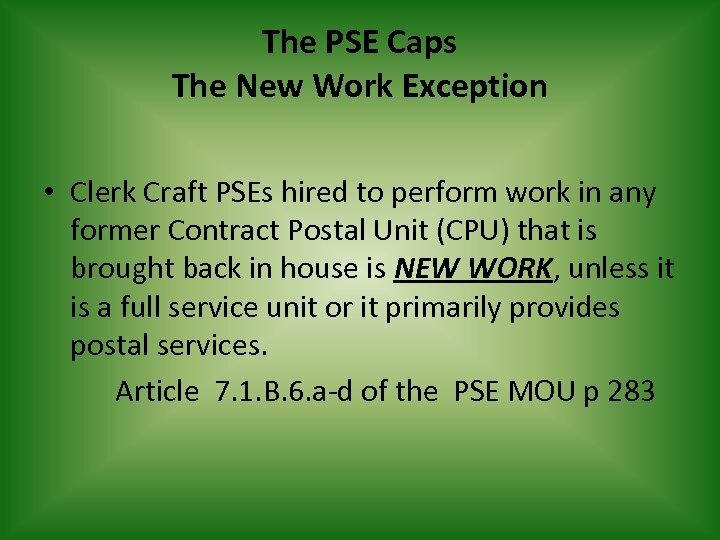 • Under the MOU, when PSE who opted on this residual has a break in service, management has the right to post or revert the duty assignment. Locals are asked to monitor those residuals. 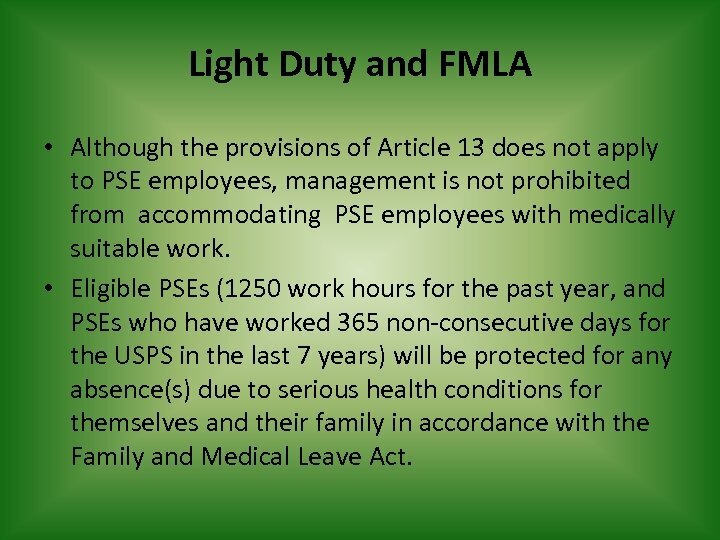 Light Duty and FMLA • Although the provisions of Article 13 does not apply to PSE employees, management is not prohibited from accommodating PSE employees with medically suitable work. 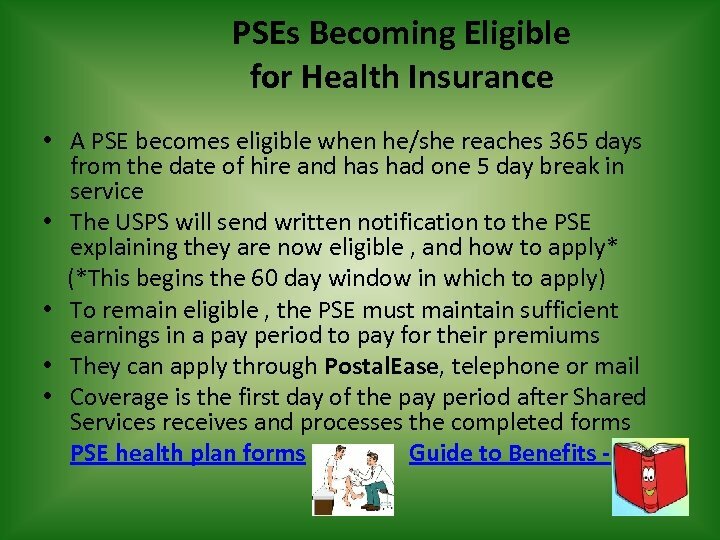 • Eligible PSEs (1250 work hours for the past year, and PSEs who have worked 365 non-consecutive days for the USPS in the last 7 years) will be protected for any absence(s) due to serious health conditions for themselves and their family in accordance with the Family and Medical Leave Act. 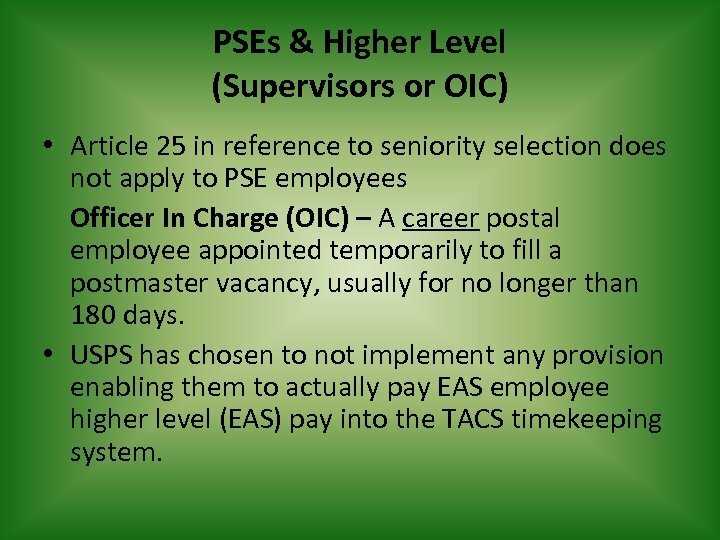 PSEs & Higher Level (Supervisors or OIC) • Article 25 in reference to seniority selection does not apply to PSE employees Officer In Charge (OIC) – A career postal employee appointed temporarily to fill a postmaster vacancy, usually for no longer than 180 days. 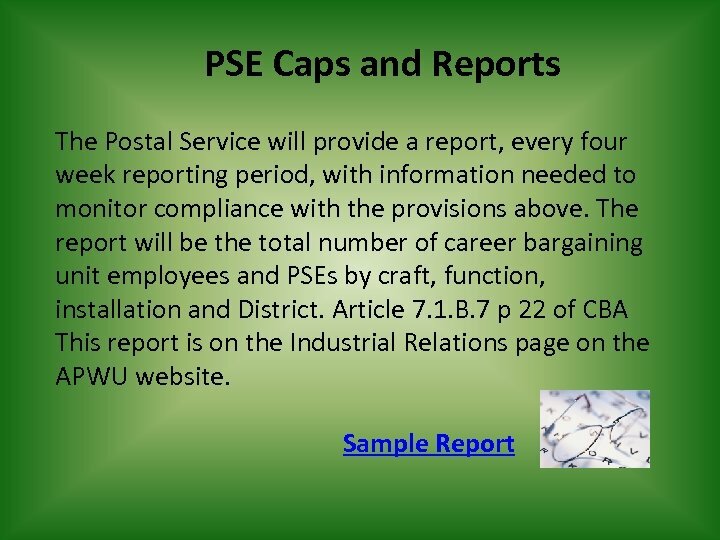 • USPS has chosen to not implement any provision enabling them to actually pay EAS employee higher level (EAS) pay into the TACS timekeeping system. 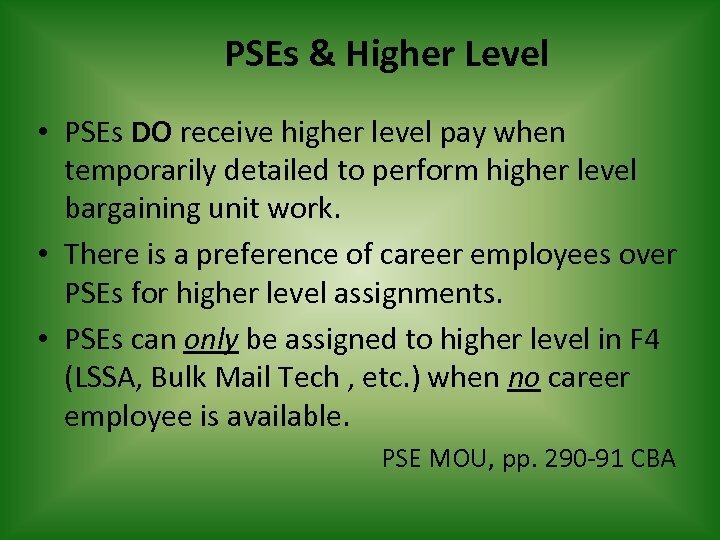 PSEs & Training There are no restrictions on which training can be given to PSEs. 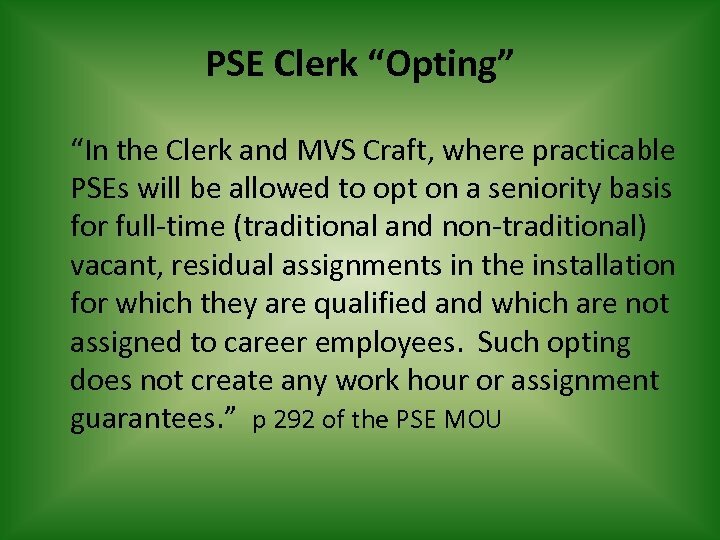 However, if a higher level assignment is the result, we need to investigate why career employees were not considered under the MOU. 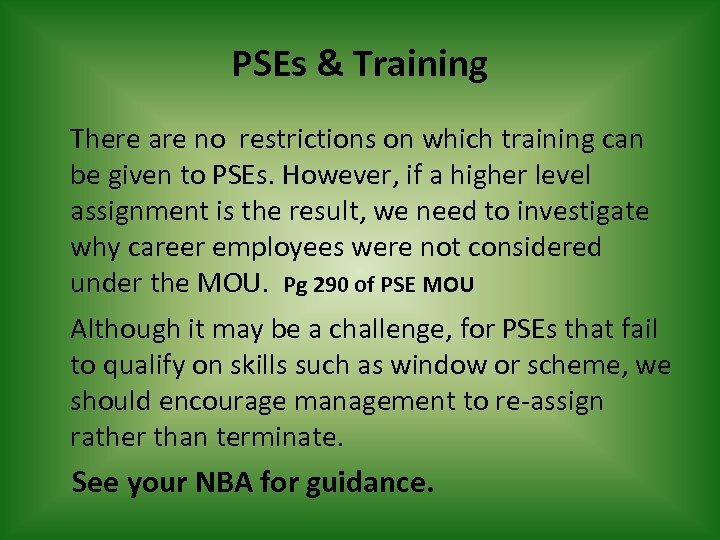 Pg 290 of PSE MOU Although it may be a challenge, for PSEs that fail to qualify on skills such as window or scheme, we should encourage management to re-assign rather than terminate. See your NBA for guidance. 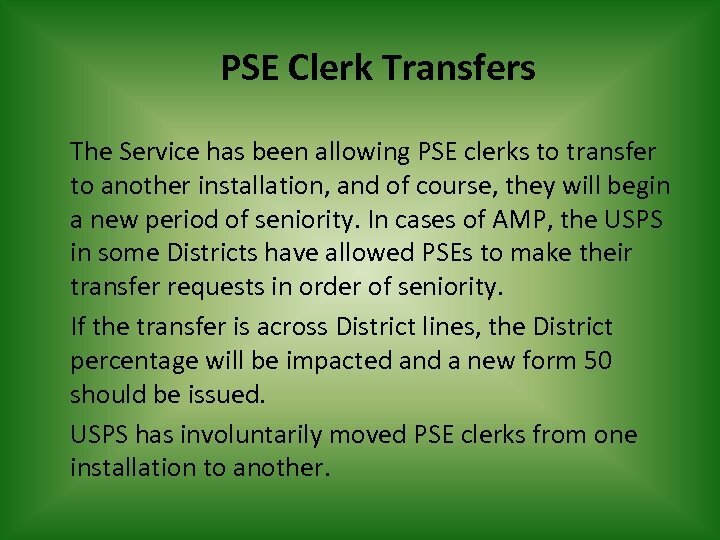 PSE Clerk Transfers The Service has been allowing PSE clerks to transfer to another installation, and of course, they will begin a new period of seniority. 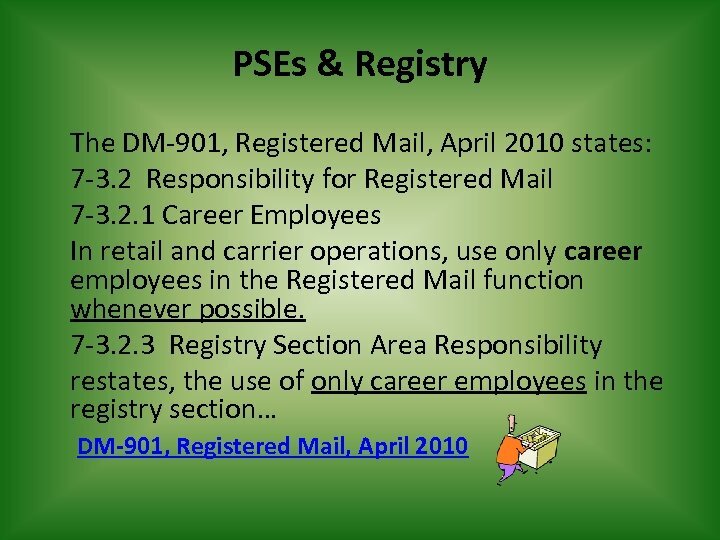 In cases of AMP, the USPS in some Districts have allowed PSEs to make their transfer requests in order of seniority. If the transfer is across District lines, the District percentage will be impacted and a new form 50 should be issued. 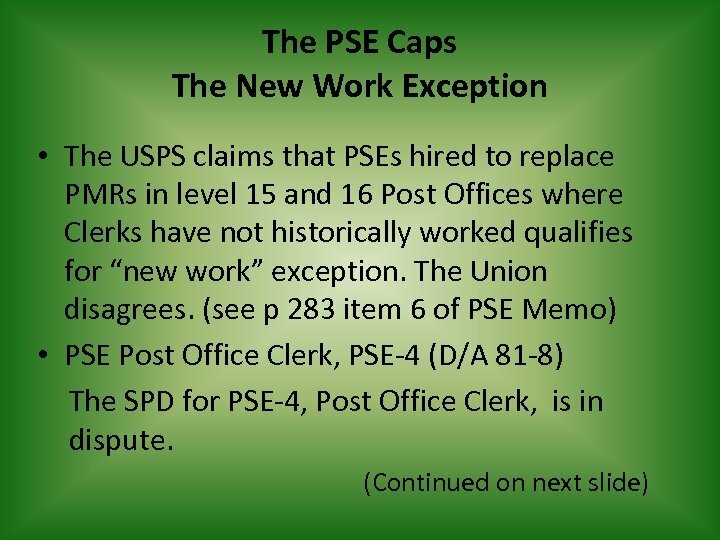 USPS has involuntarily moved PSE clerks from one installation to another. 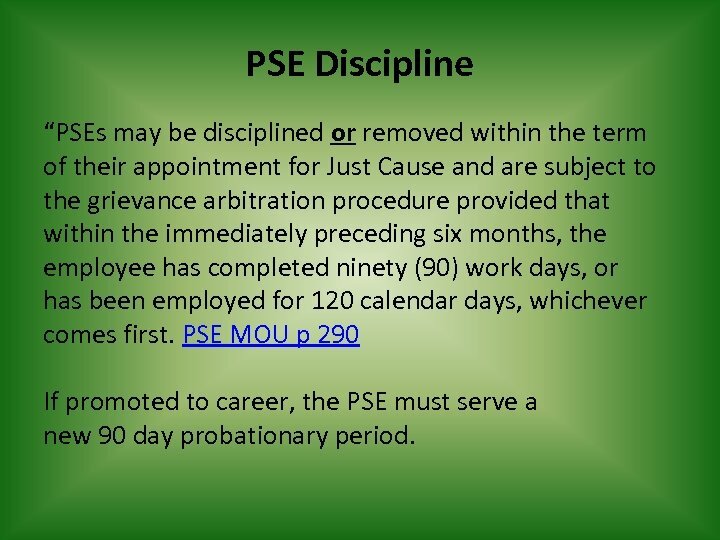 PSE Discipline “PSEs may be disciplined or removed within the term of their appointment for Just Cause and are subject to the grievance arbitration procedure provided that within the immediately preceding six months, the employee has completed ninety (90) work days, or has been employed for 120 calendar days, whichever comes first. 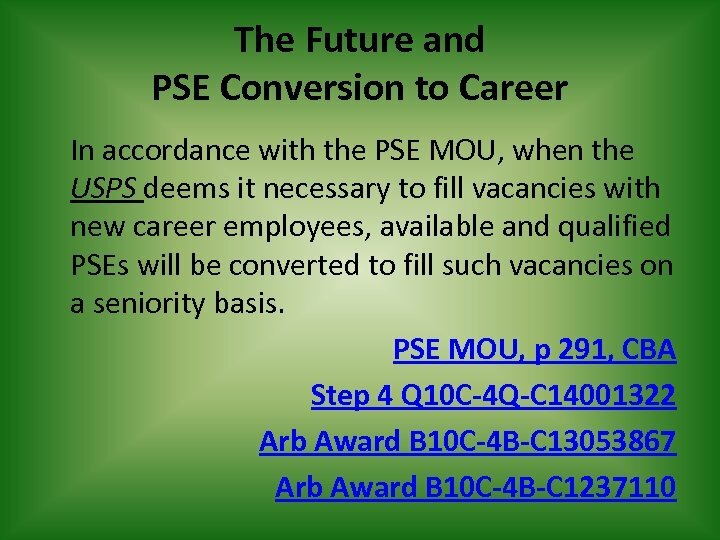 PSE MOU p 290 If promoted to career, the PSE must serve a new 90 day probationary period. 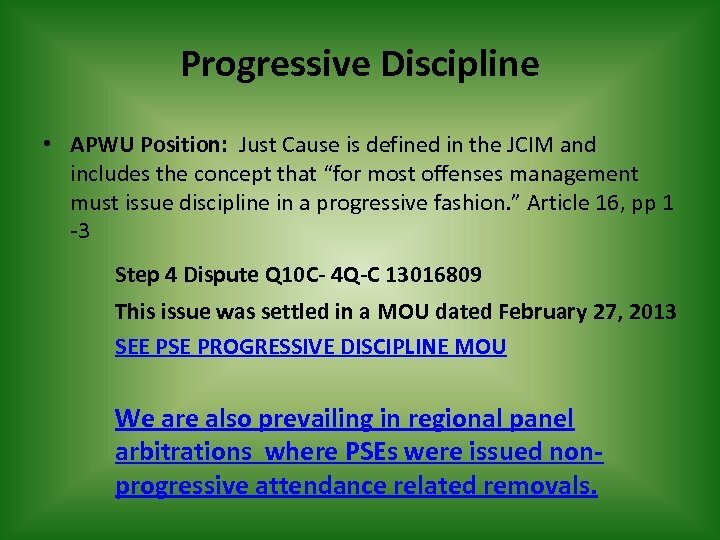 Progressive Discipline • APWU Position: Just Cause is defined in the JCIM and includes the concept that “for most offenses management must issue discipline in a progressive fashion. 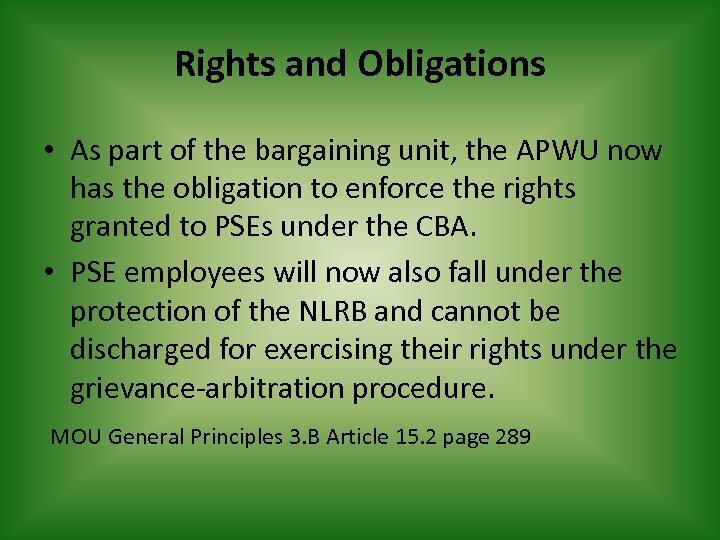 ” Article 16, pp 1 -3 Step 4 Dispute Q 10 C- 4 Q-C 13016809 This issue was settled in a MOU dated February 27, 2013 SEE PSE PROGRESSIVE DISCIPLINE MOU We are also prevailing in regional panel arbitrations where PSEs were issued nonprogressive attendance related removals. 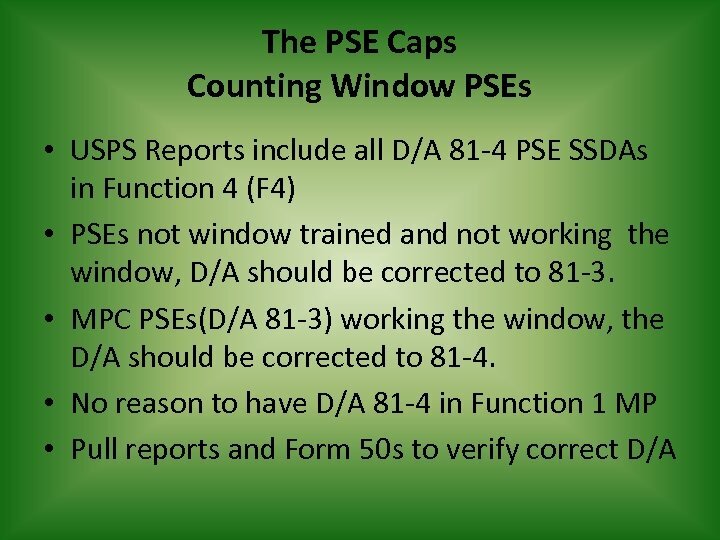 The PSE Caps Counting Window PSEs • USPS Report includes all PSE SSDAs (D/A 81 -4 in F 4). 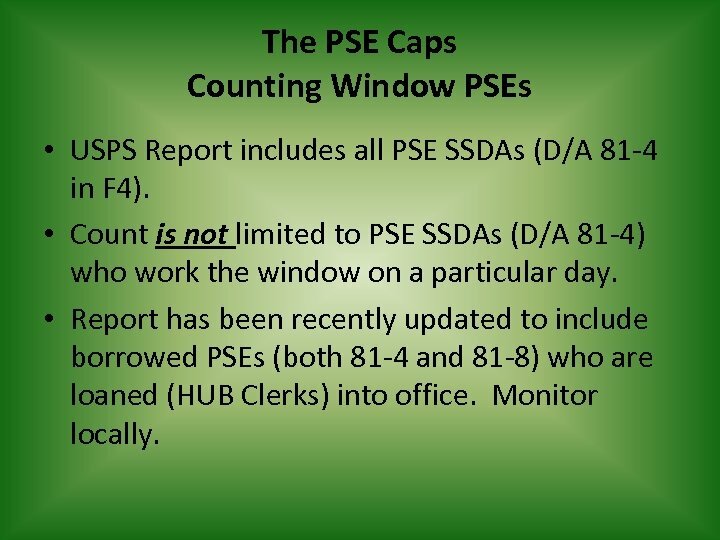 • Count is not limited to PSE SSDAs (D/A 81 -4) who work the window on a particular day. 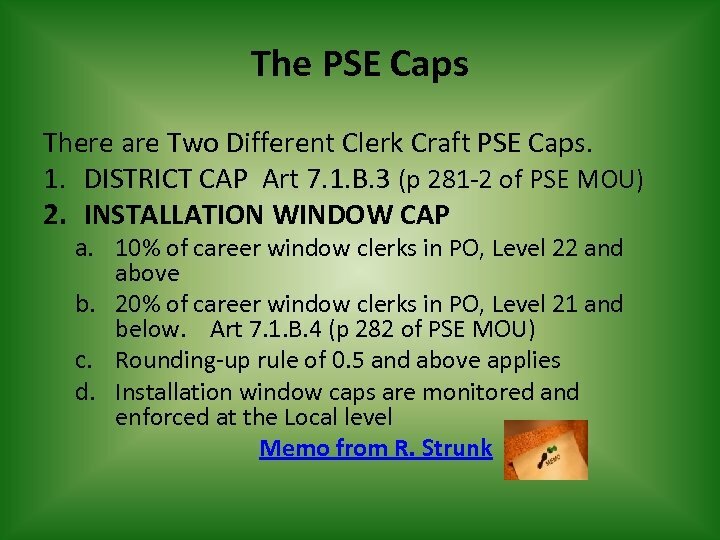 • Report has been recently updated to include borrowed PSEs (both 81 -4 and 81 -8) who are loaned (HUB Clerks) into office. 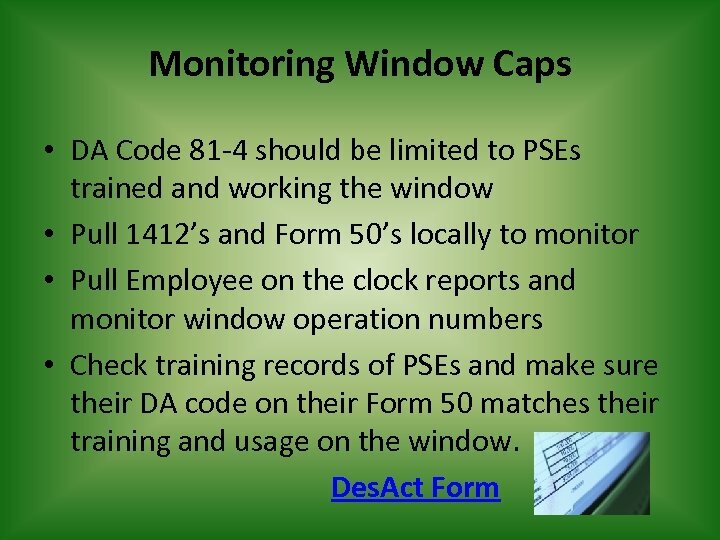 Monitor locally. 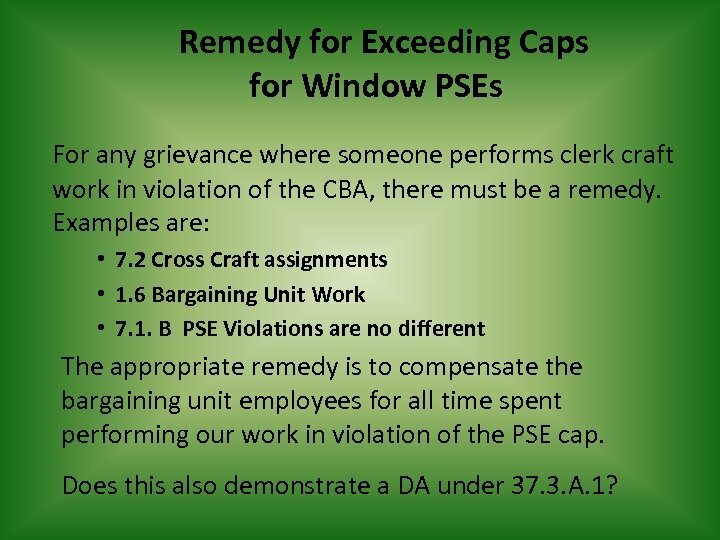 Remedy for Exceeding Caps for Window PSEs For any grievance where someone performs clerk craft work in violation of the CBA, there must be a remedy. Examples are: • 7. 2 Cross Craft assignments • 1. 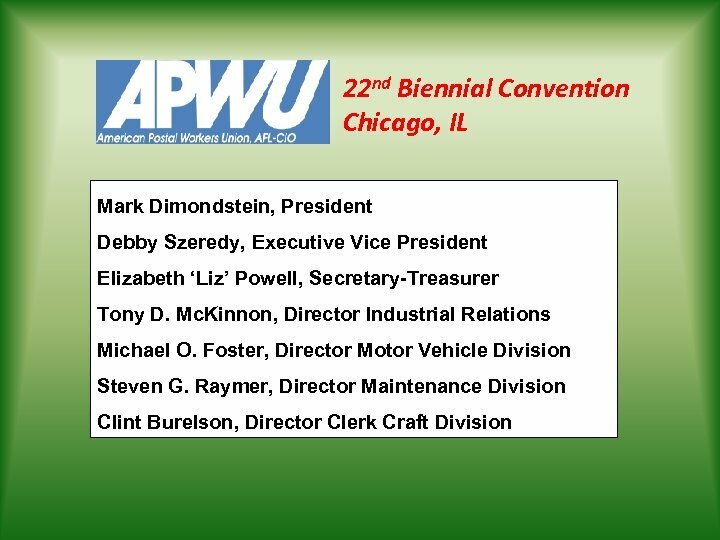 6 Bargaining Unit Work • 7. 1. 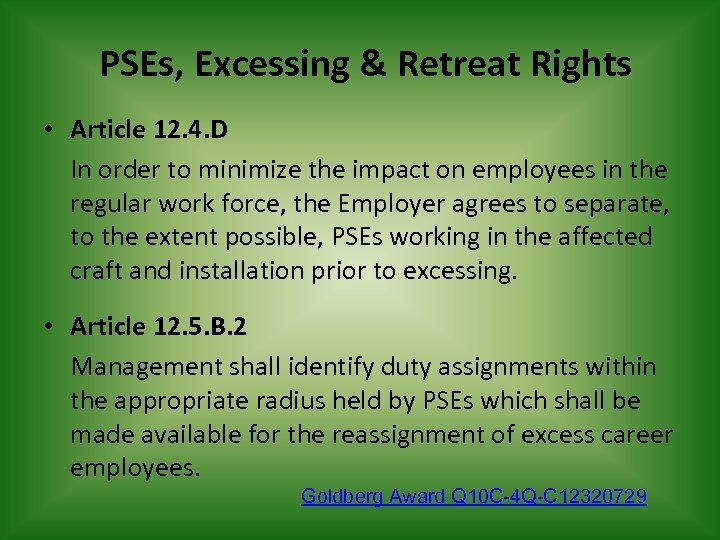 B PSE Violations are no different The appropriate remedy is to compensate the bargaining unit employees for all time spent performing our work in violation of the PSE cap. Does this also demonstrate a DA under 37. 3. A. 1? 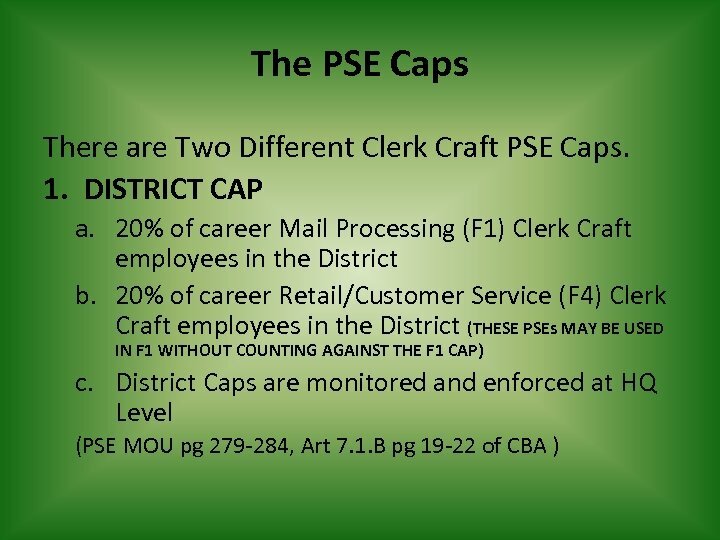 The PSE Caps PSE-4, Post Office Clerks (D/A 81 -8) • The Standard Position description created by the USPS for a PSE-4, Post Office Clerk (D/A 81 -8) limits use to Level 15 and Level 16 Post Offices. Note: There are numerous violations nationwide. We must be pro-active and file those grievances. 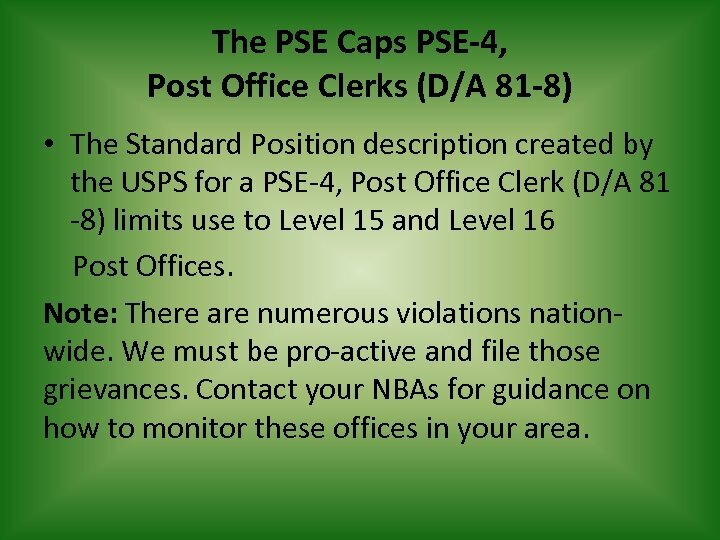 Contact your NBAs for guidance on how to monitor these offices in your area.